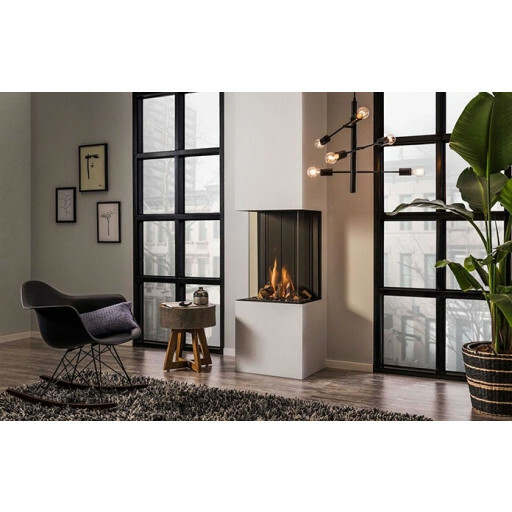 These stunning fires make an amazing centrepiece in any home. The three side fires allow a totally unrestricted view of the fire from all sides of the room at the touch of a button. Choose from four different size options, available in both natural gas and LPG. Ecomax remote control - this sleek designed handset features thermostatic control, countdown timer to automatically turn off the fire, and an Ecomax button, allowing random high-low adjustment of the flames to regulate room temperature, resulting in 40% energy saving. Adjustable legs - allowing you to easily install the fire at your desired height without the need for further, unnecessary building work. Control access door - a neat, gloss finish, access system to allow access to the manual fire controls. Convection vents - two of these are supplied with each fire to allow convected hot air from the chimney into your room.